Discussion in 'Cross Country, All Mountain & Trail Riding' started by panajotov, Aug 27, 2012. Hi guys, I'd like your opinions and help to decide which bike to choose. I work as a mountain bike guide in Macedonia. Our tours are 5-10 days long, and we ride 50+km / 1.000+m elevation daily. We use backcountry roads and some technical singletracks with 1.500+m descents. I know that a 140mm bike will descend better, but is the pedaling efficiency much better on a 120mm bike, since the 140 has a 120-150 travel fork and they both have Pro-Pedal? I don't mind pedaling a bit harder (and more) but I don't want the bike to be over kill for all that climbing. What is your experience? I'm not sure they are even different frames. 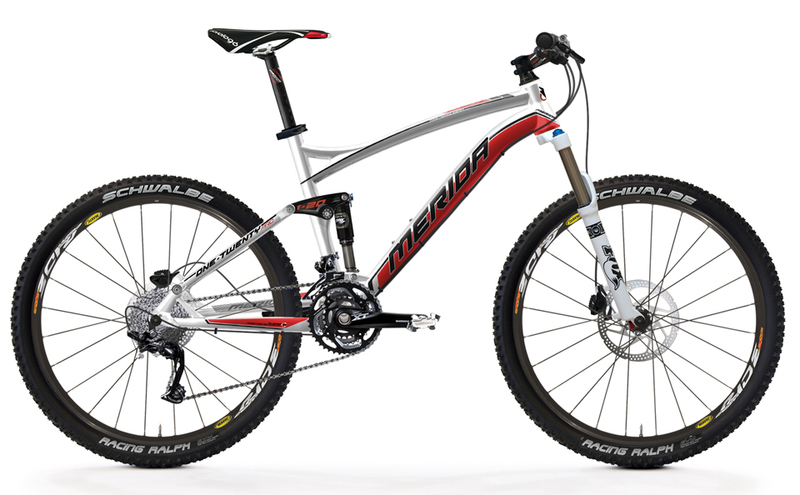 The One-Twenty has a 120mm fork and a 69 degree head tube angle. Typically 20mm of fork travel slackens the head angle by one degree, and the One-Forty has 68 degree angle with a 140mm fork. I think Merida made a huge mistake by offering two bikes almost identical to each other. The geometry and weight are very similar, making it hard for the customer to tell the difference. As for you, I would probably get the One-Twenty because it is a simpler bike. The Talas, which I use, is not as plush as the Float and has a feature which some riders do not use, the travel adjuster. But you also have to consider what kind of trails you are riding: smooth fireroads and singletrack. And my guess for the singletrack is you are not plowing long rock gardens followed several drops. I am also going to guess you probably use a hardtail right now, and it is adequate enough that you do not have to walk your bike anywhere. If that is the case, then why get a bigger bike? Especially one that is not much bigger at all? Hard to say. The additional travel isn't enough to really make much of a difference in the vast majority of riding conditions. But I'm a HUGE proponent of travel adjustable forks like the TALAS. According to the description, the one-fourty offers VPP. That and the TALAS make it a better all around bike (IMO), but I'm not sure either of those features (vpp or travel adjustment) matter much to you given the kind of riding you do. Sanjuro, I thought the same about the frames. 2012 frames were different. Maybe these are not final pictures, dont know. For now I'm riding a HT with 130 fork. And about the trails, I'm riding almost anything, but for singletracks with big drops, rocks and roots, and a few good DH tracks its riding and carrying, or go fast and pray. Well, the problem then becomes the opposite: if 90% of your riding is smooth fireroad, would you rather ride the steeper, slightly lighter bike than the heavier bike? For example, I use a Blur LTc with a 150mm TALAS fork for the rough stuff, but for the easy trails, I ride a 29er hardtail with only 90mm of travel. It sounds like to me since you are going to ride a little technical, you might as well get the bigger bike. they are def. different frames, check the linkages and rear ends. The 140mm rear end looks stiffer(extra bracing) and yeah the vpp for 140m.. I would def. go for the 140 w/the vpp vs the single pivot 120.. I've been digging the less is more mindset lately. 110mm on my 650b bike, and it's superb through the moguls. I can't say I long for more travel, after riding bikes with up to 9" as well as hardtails. 4-5" is right on the money, unless you're a bro who needs knee shin guards to ride XC trails.